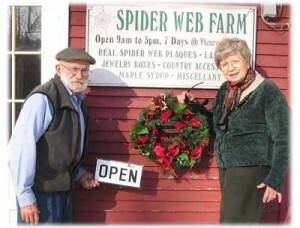 Although we know it’s coming the first snowfall here at the Spider Web Farm catches us by surprise. We know that spiders have been dormant for a good month but the blanket of snow seems to settle them down, inside as well as outside. We do the same. The rush to respond to traffic is gone and life takes on a more leisurely pace. I get a “well deserved” rest while Terry takes on the paperwork that piled up over the year. The store is open as usual 10 to 4 (it’s dark early) every day until Christmas. And, of course, we are open 24-7 here on the Web site.